Dr. Sanford “Sandy ” Roberts II was born in San Diego, California. He is a graduate of the Air Force Academy and he attended medical school at the Uniformed Services University of the Health Sciences (USUHS) in Bethesda, Maryland where he was selected to the Alpha Omega Alpha (AOA) honor medical society. He went on to complete his ophthalmology residency at Wilford Hall Medical Center and he also completed a Pediatric Ophthalmology fellowship at Duke University in Durham, North Carolina. 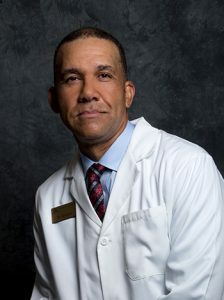 Dr. Roberts is joining our practice after serving over 24 years in the United States Air Force. For the last ten years he served as Chief of the Air Force Pediatric Ophthalmology Service while maintaining a diverse comprehensive ophthalmology practice as a leading cataract and refractive surgeon. He was awarded the resident teacher of the year in 2006 and he has participated in twelve humanitarian missions to Honduras, Mexico, and El Salvador. Dr. Roberts is married to his childhood sweetheart, Rosa, and they have four children. He enjoys spending time with his family, golfing and roller skating.